On November 27, 1995, the King County Sheriff’s Office responded to a call of a suspicious vehicle parked in the 200-block of SW 97 PL in White Center. Upon their arrival, deputies found an African-American male, identified later as Kenneth Ruffer, age 26, shot to death within the vehicle. The ensuing investigation identified numerous persons who knew Mr. Ruffer. 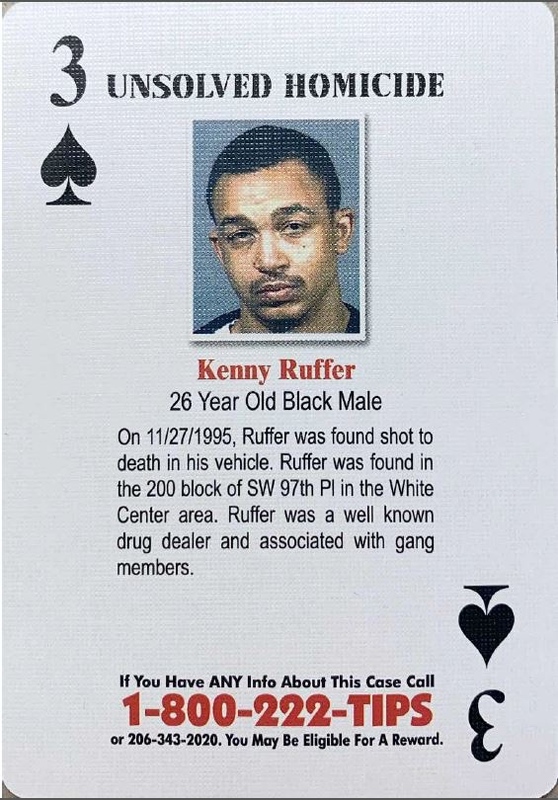 It was ultimately learned that Mr. Ruffer may have been set up for a robbery by a female associate who at the time was 25 years old. A male suspect at the time of the murder was 29 years old, and was named as an accomplice to the robbery-murder. Collected evidence was examined by the Washington State Patrol Crime Lab with a DNA analysis conducted. A full DNA profile was obtained which subsequently matched a reference sample collected from the male suspect. Although DNA evidence did allow for the identification of a suspect in this case, cooperative witnesses had to be developed. Detectives spent the past year re-examining the case, its evidence, and tracking down and re-contacting witnesses in order to develop that level of cooperation. On February 13, 2019, the now 52 year-old male and 48 year-old female, were booked into the King County Jail on Murder 1 charges.